The title is really a misnomer. It's about so much more than flowers. What's so wonderful about The Cut Flower Garden are the options. It's a gardening book, but the ladies are not talking about an ornamental mixed perennial border. Many of the same plants you might grow in a border are good as cut flowers. But taking flowers from the border for bouquets rather defeats the purpose. Nope, flowers grown in rows like broccoli or corn in your vegetable garden with a focus on production; a cutting garden. 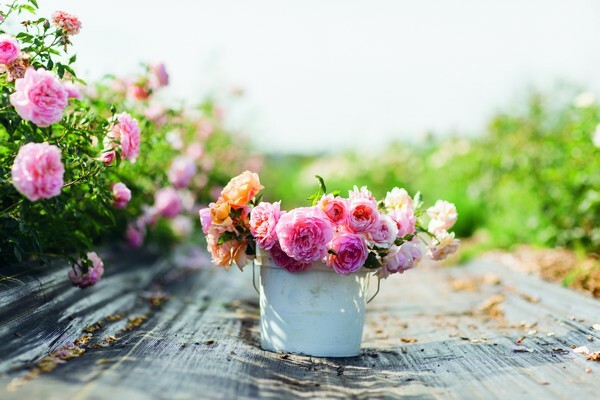 What to grow, down to details of specific cultivars of roses and dahlias, peonies, bulbs, assorted hardy and tender annuals, shrubs for flowers and for attractive foliage, and more. 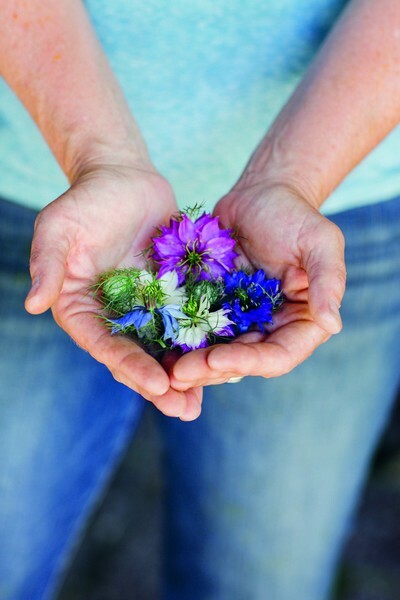 There's more to it than stepping into the garden with a basket over your arm, plucking daisies as you go. 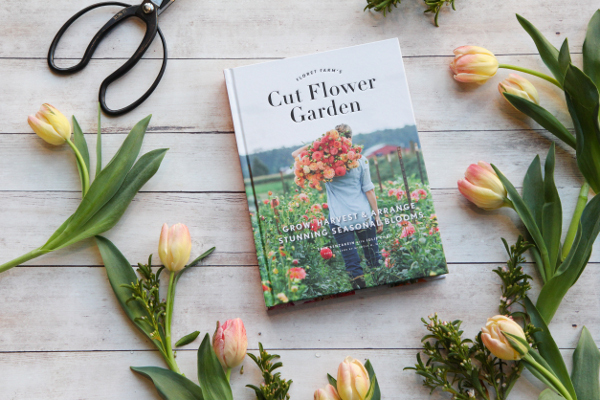 As well as caring for the plants you grow, there's information on when to cut, how to cut, and how to care for cut flowers. Did you know yarrow and zinnias are "dirty flowers" that turn water in a vase murky? Add a few drops of bleach to counter this habit. 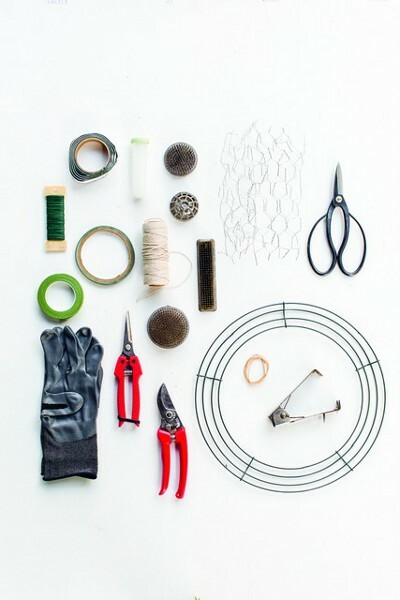 And just as a gardener has tools to use, a florist has a toolbox too. 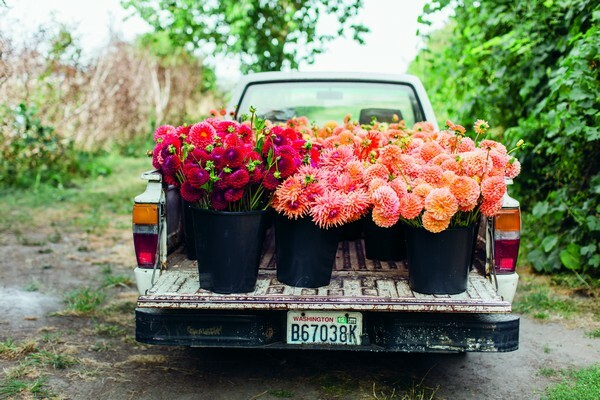 Mostly arranged seasonally, Spring begins with familiar tasks such as preparing the soil, planting seeds, dividing dahlias, and on and on, to weeding. Sounds familiar to a gardener, at least so far. Once the last of the tulips are gone, and before the hardy annuals start, biennials provide the next group of material to harvest in the cutting garden: foxgloves, columbine, money plant, dame's rocket. Included with each plant is information on when / at what stage to harvest, how long to expect them to last in a vase, and any special care, or not, that might be needed. that cutting with such abundance as to make an armful is not noticeable. and also attractive seed pods used fresh, or even dried. Now you've grown the early flowers, now they've been harvested, what next? Spring Projects. Lilacs in a French flower bucket, with tulips and hellebores. 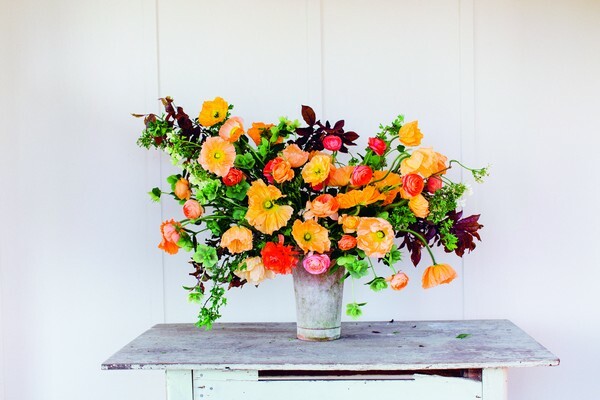 bouquet in sherbert colors of peach, coral, apricot, tangerine, and salmon, which blends Iceland poppies, ranunculus, hellebores gone to seed, and just to keep things from overly sweet - branches of dark purple plum leaves, viburnum in bloom, and hawthorne in bud. We're told to remember to sear the poppy stems with an open flame or boiling water for a few seconds. Pick ranunculus when "buds are colored and squishy like a marshmallow, but not yet fully open, for a vase life of 10 to 12 days." I really like the suggestions for using flowering branches of fruit trees such as crabapples, foliage from beech and hornbeam, and raspberries just coming into fruit. Of course, information on vase life tricks to help keep them looking good. 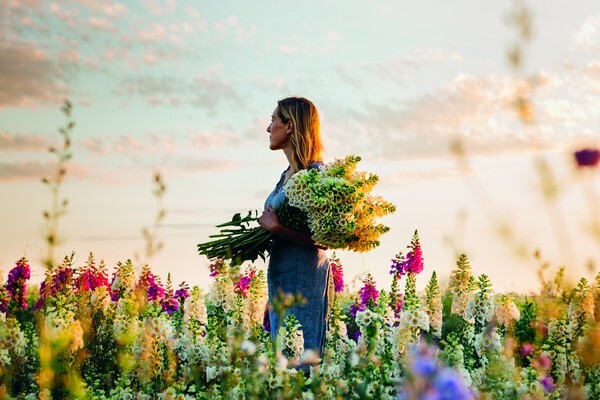 Lavish summer annuals from antirrhinum (that's snapdragons to you) to zinnias. Autumn comes and it's time to put the garden to bed. Still cutting: autumn flowers such as black-eyed Susans and we cannot forget chrysanthemums. Edibles (well, sort of) ornamental cabbages and kales. The ornamental cabbages should have been crowded in their rows to encourage smaller, more usable stems. Fruiting branches, now - rose hips, grape vines, snowberries, hypericum. Grains and pods. Ornamental grasses. Pumpkins, gourds, and squashes. A gardener's year is never done, it cycles from one season to the next. Winter berries, blooms and foliage. Amaryllises, they call them. Yes, they make a good, long lasting cut flower, but so top heavy that a bamboo skewer piecing the hollow stem and secured with a cotton ball is suggested. I have a hint of my own - the cut stem will sometimes split and curl at the base. Which can be prevented with a griddle of stretchy green florist's tape at the base when first cut. Directions for wreaths and garlands. How to force branches of fruit trees, forsythia, willow. The gardening directions, tips, suggestions are right on. The same for how to cut, vase life keeping, and some step by step directions for lush country style arrangements. Profusely illustrated, all that's absent is the fragrance of the flowers. A review copy of this book was provided by the publisher.